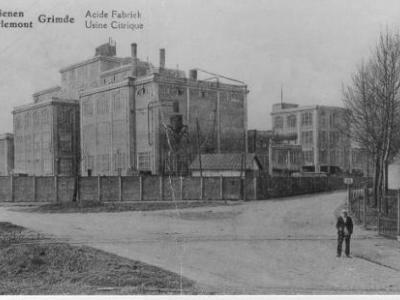 In 1916 Alphonse Cappuyns began research at the University of Louvain into producing citric acid by fermenting sugar. Entrepreneurs perceived this development as a business opportunity for the local sugar industry. Given the first, very promising, results “Les Produits Organiques de Tirlemont” (P.O.T.) was established in1919. The first fermentation chamber was filled with 1,300 kg of sugar and seeded with citromyces. Unfortunately, the first yields were extremely low. Even after some improvements, this new fermentation process could not compete with the lemon refining industry, based mainly in Sicily. In October 1925, P.O.T. had to cease its production activities. Despite this setback, Alphonse Cappuyns continued to believe in the eventual success of his approach and began his research once again, this time using a new micro-organism: Aspergillus niger. With this second attempt, he achieved a production yield that justified industrial operations. 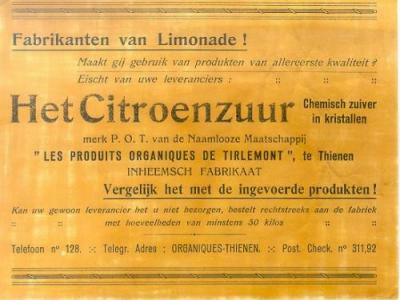 In 1929, a Belgian - Italian joint venture was established : La Citrique Belge. The Belgian know-how in fermentation was combined with the Italian know-how in refining citric acid. In 1947, fermentation of molasses - a by-product of the local sugar refinery - was introduced as a replacement of the fermentation of the much more expensive pure sugar. At the same time, the Italian joint venture partners left the company and La Citrique Belge became 100% Belgian. 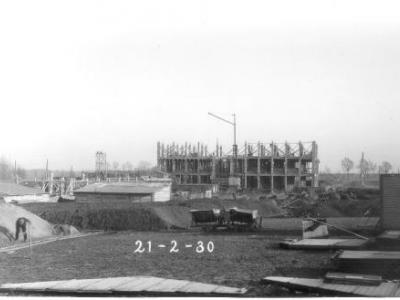 In 1977, Citrique Belge became a member of the Swiss pharmaceutical group F. Hoffmann La Roche. Citric acid was a good addition to the product portfolio of the leading supplier of vitamins to the food industry. The company expanded production to over 112.000 ton/year and started a joint-venture with a Chinese plant in Wuxi. In 2003, Citrique Belge was sold to DSM. After some improvements in the production organization and an increase of the capital, the capacity rose to 120.000 ton and the Chinese plant was closed. In October 2010, Citrique Belge became a member of the ADCURAM Group. Important investments were done not only in refinery but also in fermentation and waste water treatment. End of 2016, Citrique Belge was acquired by an international group of private investors represented by Riflebird Capital. These private investors all share a common long term vision of creating profitable growth in specific industrial companies via a quality-driven operational management, strategic orientation and a close, enduring relationship with its B2B customers. Being a stand-alone investment, Citrique Belge now enjoys the autonomy to continue to invest in fermentation, downstream processing, quality, product development, sales and logistics to remain a reliable supplier of citric acid and its derivative products - providing excellent service, technical expertise and quality products - in the many years to come. After several important reorganizations and major investments to modernize and optimize the production processes, Citrique Belge is, today one of the largest and most efficient citric acid producers in the world.